Mashed potatoes are the world's most comforting food. 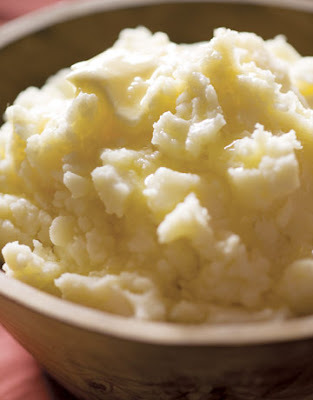 During this cold weather, go back to the basics and enjoy some delicious mashed potatoes. I have to admit . . . a very cranky man, an employee at Williams Sonoma, set me straight in my mashed-potato ways. He looked at me with dead eyes and an open-mouthed aghast expression when I mentioned I used a hand mixer to mash my potatoes. 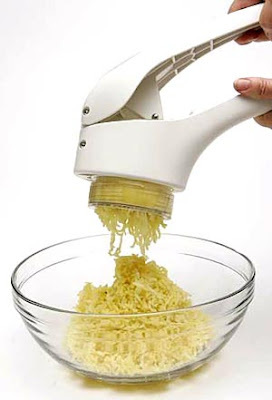 He finally explained that he only uses a potato ricer (imagine a giant garlic press), because it keeps potatoes light and fluffy. I recovered from my shame, and that night I used a fork to mash my potatoes instead of an electric mixer. Cranky Man did give me one piece of potato-mashing advice that has made all the difference: heat the butter, cream/milk, salt and pepper in a small saucepan before adding to the potatoes. Classic Mashed Potatoes 8 russet potatoes (peeled and cubed) 3 tbsp. butter 1/2 cup half-and-half salt and pepper to taste 1. Bring water to a boil, and place potatoes in pot (uncovered.) 2. When potatoes can be pierced with a fork without any resistance, drain in a colander. 3. Return potatoes to pot and remove from heat. 4. Mash with a fork or potato ricer. 5. Heat butter, half-and-half, salt and pepper in a small sauce pan. When heated through (but not boiling) add to mashed potatoes and mix together. Add additional salt and pepper if needed and serve with anything!